For opening hours information, please contact the Meadowtown Centre directly. Meadowtown Centre offer more than 29 brand name stores. 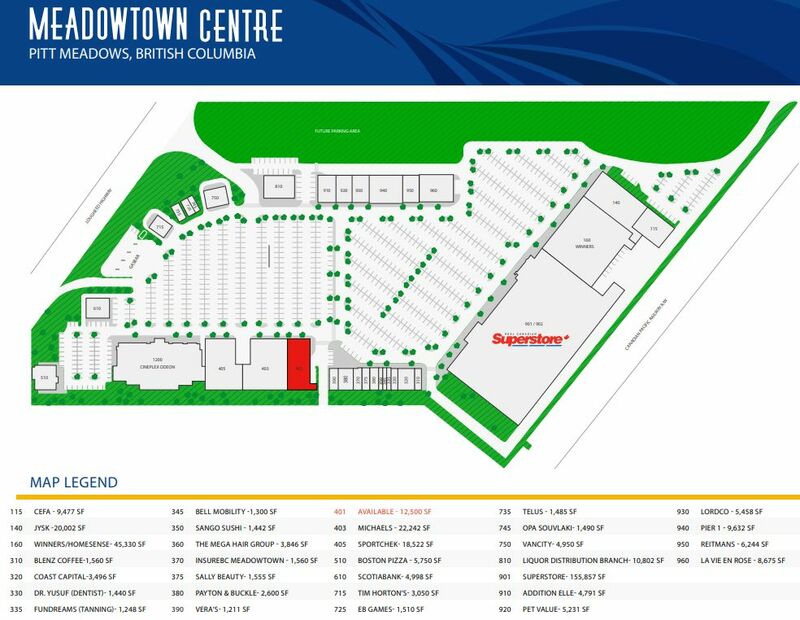 Meadowtown Centre is located in Vancouver, British Columbia - 19800 Lougheed Highway, Pitt Meadows, British Columbia, BC V3Y 2S9, Canada (GPS: 49.222106, -122.666191). Look at the list of stores in Meadowtown Centre, hours, location and information about mall and special events, sales, coupons. You can choose store from list below and get detail information - other stores locations for the brand, location, shopping hours, phone, map, directions contact. Meadowtown Centre is one of the best shopping place for spend your free time - mall/shopping center has all types of stores - outlets, department, fashion, traditional and more. Have you ever visited Meadowtown Centre? Do not forget to write shopping review and rate your satisfaction. Meadowtown Centre is a 420,000 sq.ft. retail centre(the largest outdoor centre in the northeast region of the Metro Vancouver.) including a large-format food retailer, a high-end theatre, large-format clothing retailers, furniture and home accessories and service retailers. Major stores in Meadowtown Center: Real Canadian Superstore, Cineplex Odeon, Sport Chek, JYSK, Tim Hortons, Boston Pizza, Michael’s, Winners, Pier 1 Imports, VanCity, ScotiaBank. Give us your experience with Meadowtown Centre by writing a short review.